Given that very few private colleges meet 100% of financial need, the cheapest option for most low-income students will be one of their state’s public universities. There will always be some low-income students that will have their full need met at private colleges, but they will be the exception. The majority will find themselves “gapped” and forced to consider private loans to make up the difference. You might be thinking that public universities on average meet a lower percentage of student need than private schools and you would be right. But the fact remains that public schools are significantly cheaper. For example, if a public school only meets 50% of need, the student is likely to still have to pay around $10,000. Private schools would have to meet approximately 80% of need for the student to pay the same amount. And the whole concept of “meeting need” can muddy the waters. On the Common Data Set (CDS), colleges report the average percentage of need met and the percentage of the students who have 100% of their need fully met. The later number can be quite low. Take a look at NYU. According to BigFuture, NYU met 56% of need for undergraduates. This means that if all the undergraduates’ financial need amounted to a $1,000,000, the school provided $560,000 in aid. But that number doesn’t say anything about how the money is distributed among those with need. NYU reported that only 10% of undergraduates had their need fully met. And don’t go assuming that the students in 10% were the neediest. If you think about it, it’s a lot easier to meet 100% of need for students who only need $5,000 instead of $20,000. Instead of focusing on “percentage of need met,” low-income students are probably better off just looking at the average net price for the lowest income category. Schools can’t use subsidized loans to lower the average net price. However, they are allowed to include them when calculating percentage of need met for the CDS. The Integrated Postsecondary Education Data System (IPEDS) reports average net price for students with family incomes of $30,00 or less. You would think that the average net price would be fairly low for this category. Yet among 66 colleges that claim to meet 100% of need, the average net price for this category ranged from a low of 0 (and 2 with negative numbers-yes, this is possible) to a high of $21,261. Approximately a third of the schools had averages over $10,000. According to IPEDS, New York University freshman with family incomes of $30,000 or less paid an average net price of $25,964. See what I mean? Go with the average net price. The table below lists public 50-50 colleges with an average net price of $10,000 or less for those with family incomes of $30,000 or less. Out of 185 public 50-50 colleges, only 58 made the list. Furthermore, they represent only 22 states. Of course, not all states have public 50-50 colleges. 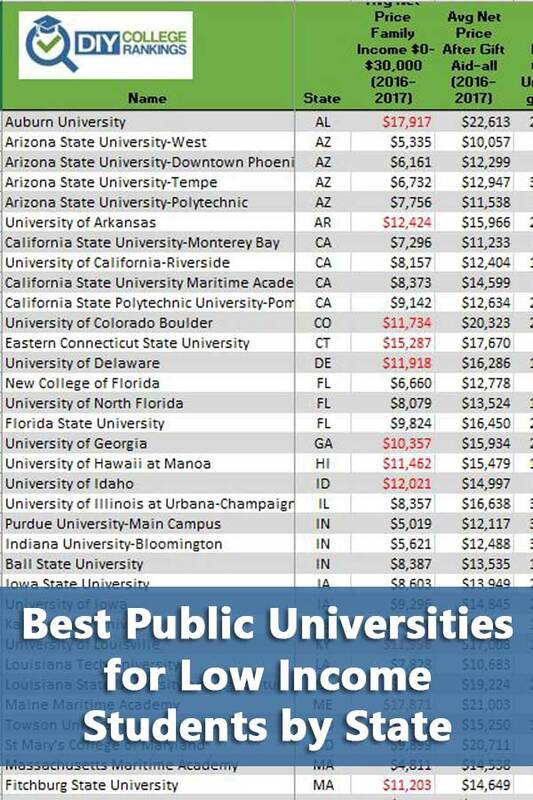 The list below includes the public 50-50 college with the lowest average net price for the lowest income category even if it was over $10,000. In some states, such as Wisconsin, Maryland, and Indiana, the lowest average net price wasn’t significantly different from the other public 50-50 colleges in the state. Other states had more dramatic differences. In Virginia, Massachusetts, and Pennsylvania, there was more than a $10,000 difference in the public university with the lowest average net price and the one with the highest average net price. The following table lists the lowest cost 50-50 public institutions for 47 states. As usual, the 5-year graduation rate is used public schools. Red text indicates schools where the average net price for the lowest income category was over $10,000. All of this information is part of the DIY College Rankings Spreadsheet.